LOS ANGELES, CA--(Marketwired - Sep 21, 2015) - Blaze Fast-Fire'd Pizza, the fast-casual artisanal pizza concept known for its chef-driven menu and casually hip restaurants, announced today that it will open in Schenectady on Thursday, September 24th. To celebrate the grand opening, the restaurant will offer FREE build-your-own artisanal pizzas on Friday, September 25th from 11:00 a.m. to 10:00 p.m. to anyone who follows Blaze Pizza on Instagram, Twitter, or Facebook. The highly anticipated restaurant, which features a thoughtfully designed 2,400 square foot interior with seating for 50 inside, is located at Schenectady's Mohawk Commons Shopping Center (400 Balltown Rd.). 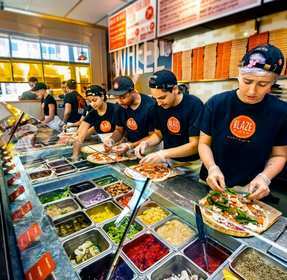 Blaze Pizza is a modern day "pizza joint" serving up artisanal pizzas that are both fast and affordable. Since its first restaurant debuted in 2012, Blaze has quickly become one of the nation's hottest restaurant concepts, with fans lining up each day for the custom-built pizzas, freshly made salads, blood orange lemonade and s'more pies. Each restaurant features an interactive open-kitchen format that allows guests to customize one of the menu's signature pizzas or create their own, choosing from a wide selection of fresh, artisanal ingredients -- all for about $8. The generously-sized personal pizzas are then sent to a blazing hot open-flame oven -- the centerpiece of the restaurant -- where dedicated pizzasmiths ensure that the thin-crust pies are fast-fire'd and ready to eat in just 180 seconds. Restaurants make their own dough from scratch using a recipe developed by critically-acclaimed Executive Chef Bradford Kent (the "Pizza Whisperer"), which requires a 24-hour fermentation period to produce his signature light-as-air, crisp crust. For pizza fans with specific dietary needs, Blaze Pizza offers gluten-free dough and vegan cheese. Blaze's obsessive attention to detail extends well beyond the food, with a carefully considered, modern approach to restaurant design. Driven by its commitment to "Intelligent Choices for Our Pizzas, People & Planet," the restaurant is constructed with recycled and sustainable materials, uses eco-friendly packaging, and features energy-efficient LED lighting. Additionally, many of the restaurant's unconventional design elements were inspired by the company's celebration of individual expression, including an oversized wall graphic, which was custom-built to suit the space.